I was managing a movie theater in 2011 when Scream 4 came out. To be honest, I had no idea it was in production. I had heard rumors a few years earlier that Scream 4 might come about, but it wasn’t until I unrolled the Scream 4 poster that I realized this was in fact a real film. In 2011, a new Scream movie didn’t sound all that appealing. Scream 3 was not a good film and my nostalgia for the franchise had yet to kick in. Now, if someone were to announce Scream 5, I would be jumping for joy and following every step of the production, but in 2011, things were different. Scream 4 came to the theater, underwhelmed, and left without much of an impact. A couple of years later, I had my first urge to watch the Scream franchise since 2000, when Scream 3 came out. It’d been well over ten years by this point and the fond memories of the debate over whether Scream was good for the horror genre of not was now just a fond memory in the back of my mind. I started at the beginning and worked my way though before finally buying a digital copy of Scream 4. I found a film that was updated, yet still effective, despite the story being a little on the weak side. Sidney Prescott returns home to Woodsboro on a book tour and the Ghostface Killer returns. -Scream was great because it was very meta (a word I hate, but have no other way to describe this) and current. It took current technology and turned it against us, and in Scream 4 they continue that tradition. Cordless phones and caller ID were no longer current, and instead the film utilizes cell phones, texts, video blogging, live camera feeds, etc. All forms of technology that are still valid at the writing of this post in 2018, as well as in 2011 when the film was released. -Scream 4 decided to right the wrongs of Scream 3 by bringing back Kevin Williamson to write the script, returning the film to Woodsboro, and keeping the plot centered around the core group of survivors that we all love. They didn’t just insert these characters back into their old roles, they allowed them all to grow and adapt (some for better, some for worse) and it really felt like you were catching up with three characters ten years later who were at different phases in their life. -One of my favorite things about Scream is the music. I love the score and it’s wonderful in Scream 1, 2 and 4. I’m not sure what happened in 3 since it was the same composer. I think they wanted to deviate from the status quo and that was a mistake. I’m happy to report that Scream 4 brings back those familiar tones and it just feels right. -The movie was a little ahead of its time and focusing on the “Me Generation.” It’s about young people who want to be the center of attention, no matter what, and that is why I feel like this movie has actually gotten better several years after its initial release. -I didn’t like the relationship that Sidney had with the killer. It’s plausible, but I just didn’t buy into it all the way. -For a good part of the film, it feels like they are attempting to transition the future of Scream from one generation to another. I’m glad this wasn’t the case, because quite frankly, the scenes featuring only the young cast members were the ones that worked the less. I don’t feel this way out of favoritism for the original cast, I felt like the new cast members weren’t as well rounded or different enough to matter. -One of the rare horror franchises where all of the main characters returned for all four sequels. -The final film that Wes Craven directed before his death. -The only Scream film to use a CGI knife. 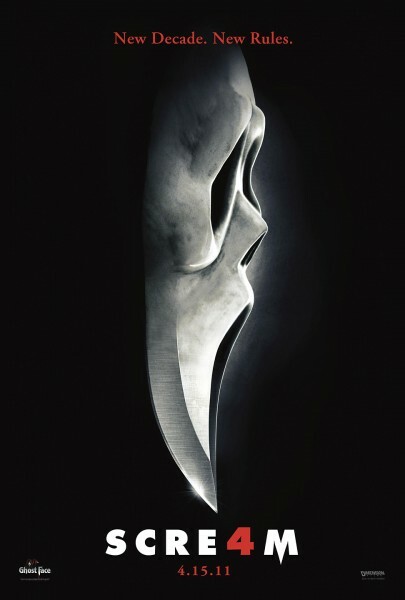 -Wes Craven only agreed to film Scream 4 if the script was as good as the original Scream. -Has the highest kill count (15) of all the Scream films. -The film opened on April 15th, 2011, fifteen years to the day of the original film’s release. -The new cast memebers were all archetypes for characters in the original film: Jill (Sidney), Kirby/Olivia (Tatum), Trevor (Billy), Charlie (Stu), and Robbie (Randy). -Kevin Williamson expressed some annoyance towards the release of the film because The Weinstein’s brought in Ehren Kruger (the writer of Scream 3) to polish up the script. Scream 4 is a good entry in the Scream franchise. I’m not sure if I’d rank it above Scream 1 and 2, but it’s definitely better than Scream 3 and feels more like a Scream film. I like how the plot was updated to feature new technology and the motive the killer is rational, especially in today’s age of social media. I rate Scream 4 as an four out of five, and say it’s a must own.